This is an important day for all Americans. The basis of whole history and lifestyle is that the United States is governed by a written constitution. 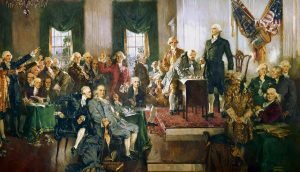 It was on September 17, 1787, that 39 of the 55 delegates to the Constitutional Convention, meeting at Independence Hall in Philadelphia, Pennsylvania signed the newly drafted U.S. Constitution. 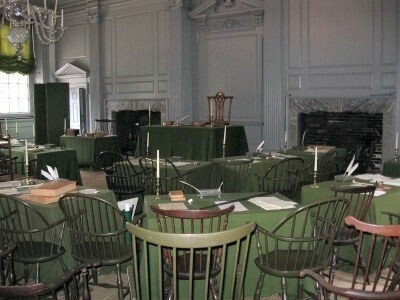 This location was selected because this was where the Declaration of Independence had been signed. The state of Rhode Island was the only state not to send delegates. Only Philadelphia was a ‘wild, ruthless city’ after the American Revolutionary War. That summer of 1787 also proved to be a very hot and humid several months. Although Philadelphia was the nation’s largest city, population then of 40,000, lodging was at a premium for these delegates coming from other states. In fact, Philadelphia was hosting a gathering of Presbyterian ministers from around the country the same time the Federal Convention (as it was called) was taking place. The Society of Cincinnati, an organization of Continental Army officers, was also in Philadelphia at the time and needed lodging. Various boarding houses were used by the delegates, seeing they would be there several months. Once the delegates began it was agreed all the delegates would keep secret what was discussed and not have the public present. So they kept the windows and doors closed – now it was even hotter. But the delegates did not complain too much. 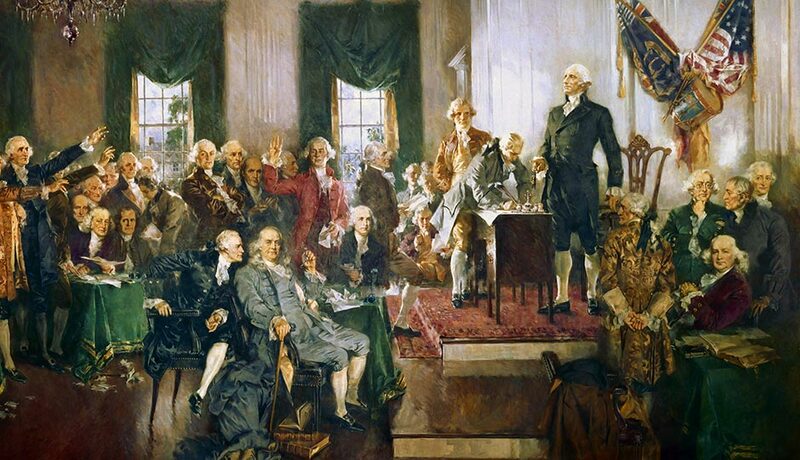 The convention had begun May 25, 1787 and was called to revise the Articles of Confederation which had existed since the end of the American Revolutionary War. At the convention, there were several delegates who felt a new form of government was needed, one to improve the federal level to help govern over the states and its present 4 million people. Two especially interested were Alexander Hamilton and James Madison. One of the biggest ideas was on July 16, 1787 when the delegates agreed that each state should have equal representation in the Senate and the House numbers would be based on population. Smaller populated states have an equal voice in the Senate and the states representing more people have a stronger voice in the House. Eventually, by September 17, 1787, the completed new form of a constitutional government with a Congress, Presidency and Judicial branches were laid out with the approval of the majority of the delegates – 39 of the 55. The youngest signer was Jonathan Dayton at age 26 and Benjamin Franklin at age 81. Franklin was sickly at this time and frail but he knew he had to be a part of the new government creation. He died April 1790. Having some background on the creation of the US Constitution is important to your family history. More people may have chosen to resettle in America from Europe or other regions because of this new form of government. Even more interesting with this new creation of constitutional government, if your ancestors already lived here in 1787 … they were at the ground floor of a new dawn. Photos: The Constitution Convention with delegates and the meeting room at Independence Hall in 1787. Ancestors in the American Revolution?